This holiday, I pledge to give books. For anyone who knows me that’s a no brainer. I give books to several people every year. But this is part of an amazing program by Chronicle Books. For every share this program receives on social media, Chronicle books will donate a book to a child in need. Wow. They want to donate 10,000 books and so far have about 7000 shares. Why not click here to find out how to record your support? I’ve got one gift book ready to go and am considering several more — which one to buy, which one to buy. Share a great story and support a great cause. For those of you who celebrate, have a very Happy Thanksgiving. Enjoy some time with your family and friends. Share good food, laugh and smile. Or, hunker down in your hobbit hole if that is more your speed. May you have a day that will fill you with gratitude. As writers we struggle. How can you present something to the publishing world that fits into a cateogory that marketing will understand while also producing something that is unique and truly your own? If you’ve tried to do this and had trouble making sales, you may be tempted to believe that it simply cannot be done. There are days that I would agree with you but then I saw this TED presentation on being yourself. At only 16, Rosie King has filmed a documentary, illustrated a book and filmed a TED presentation. She’s done all of these things living within the autism spectrum; Rosie has been diagnosed with Asphergers. I loved the part where she describes spending time in a world in her own head when the real world, very often in algebra, proves tedious and dull. And doesn’t that “world in her head” sound familiar? In spite of the fact that she does not fit in the “normal” box, Rosie has accomplished so much. As she explains it is because she finds a goal and sets about making it so. She doesn’t seek approval or evaluate her idea against others that are normal. She simply does. Where would we be in the world of literature if Rowling had agreed that her books are too long, if Jeff Kinney capitulated about combining text with simple line drawings or if Suzanne Collins realized that no one would accept such a harsh, unhappy setting in a children’s book. Find the world in your head and commit it to story. 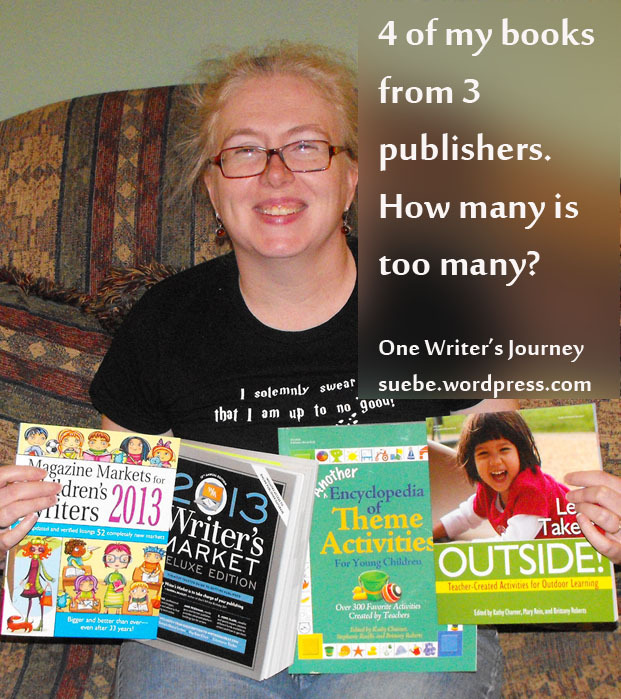 How many publishers should you write for at any given time? This is one of those questions that I’ve been pondering lately as I work to finish my lastest RedLine project while things for Schoolwide go to final. Now, I’m not technically writing anything for Schoolwide but the fact checker has come back to me with several questions. I’m also having to do author information sheets for the pieces that are nearing their release dates. Add to this the fact that I have three other editors that I work with more or less regularly. The one is getting a few blog posts a month. Another can’t purchase any new content for about 2 more months. I’m not on any kind of schedule with the third and write for her when I have time. Does this mean that I have too many editors? I don’t think so but there are people who would say yes because of the number of areas in which I write. At one point, category #3 was my mainstay but with the demise of Children’s Writer newsletter, that is no longer the case. But about the time the newsletter closed down, I was approached by Red Line after doing a lot of activities for Education.com and Gryphon House anthologies. Although I understand the importance of having a platform, I think it is also important to have a sideline or two. You never know when one or more of your “platform” jobs is going to disappear and you will need to find a new way to make a living. That’s when having credits in another area will pay off. Co ngratulations to writing buddy Darcy Pattison. Her book, Abayomi, is on the latest National Science Teachers Association Outstanding Science Trade Books for K-12, 2015. Yes, 2015. The books are all published in 2014. So cool for Darcy! Knowing the amount of work that goes into each of her titles, this is a much deserved honor. One of the best ways for teacher to do this is to share books that meet these same goals. If you write science nonfiction, these are some books that you should be reading, especially if you want your books to find their way into the classroom. I’ve already read At Home in Her Tomb by Christine Liu-Perkins and The Griffin and the Dinosaur by Marc Aaronson is sitting in my “must read” pile. Now, if you’ll excuse me, I’m picking through the list to find out what I want to request next. *quotes from the NSTA web site. 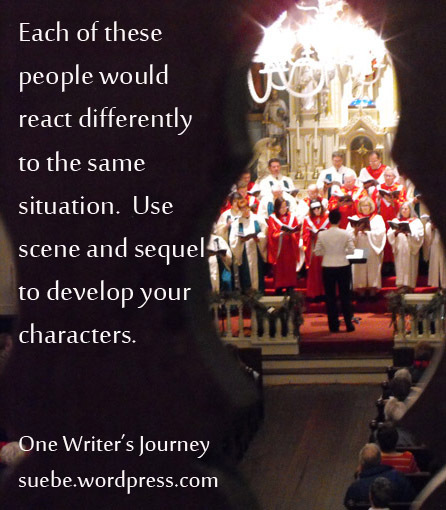 When I started writing, long, long ago before the world was color, I remember hearing about scene and sequel. Basically, the scene contains the action — wow! exciting! edge of my seat! The sequel gives your character space to react — how does this change things? What will I do next ? I haven’t seen much on this topic in quite a while so was thrilled to read K.M. Weiland’s Make Your Character Reactions Twice as Interesting. Her post is all about character depth and using sequel/reaction to create both this depth and empathy with your character. One of the reasons that we need to see your characters react is that it gives us (the readers) insight into their motivations. At best, a character who goes from one action to another without a thought in between is going to seem impulsive and shallow. And that might be your point. Maybe your character is impulsive and shallow and it creates all kinds of trouble for him. If that’s the case, make that trouble oh so obvious. But the other risk is that if we never see your character react and mull things over, we won’t have any clue why your character is moving from action a to action b, unless of course action a is climbing a mountain trail and action b is panting for breath. That’s sort of obvious. We won’t know what your character’s motivation is or why he does what he does. Your reaction time doesn’t have to be extended. In fact, some actions don’t lend themselves to long, drawn-out reactions. Accidently pull the pin on a grenade and you might need to react rather quickly unless this is one of those from the grave stories. But if you make the effort to build in some reactions, readers will know your character that much better, an essential ingredient in character driven stories. When I saw the cover of Patricia Hruby Powell’s Josephine, I did a double take. A picture book on Josephine Baker? Are you serious? Apparently you can judge a book by it’s cover and I am seriously guilty. After all, I haven’t read the book yet although I have requested it from my library. And I should really know better. After all, I’ve read Gary Golio’s Jimi: Sounds like a Rainbow. Yes, a picture book about Jimi Hendrix. And, although Hendrix had a serious drug problem and died of an overdose, it is an amazing book. The beauty of the picture book format is that you have 36 pages to tell your story. Slant it right and you can avoid the bits that aren’t age appropriate without being accused of censoring your topic. Golio did it by focusing on Hendrix’s childhood drawings and how they fueled his music later in his life. The author’s note tells how Hendrix died and discusses substance abuse and addiction. As a result, the book it totally honest and totally age appropriate. Since I haven’t yet read Josephine, I don’t know how Howell pulls it off. I do know that the story is told in verse and that the rhythms and energy echo Baker’s life. 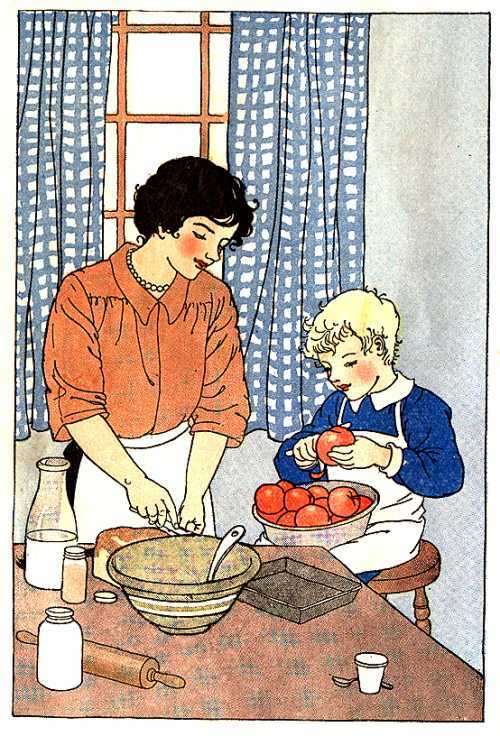 Who else may or may not make a good candidate for a biography for the very young. Charles Lindbergh, humble and hard working early in life, would be excellent. Charles Lindbergh, father of a kidnapped and murdered boy? His later political statements? Nope. I wouldn’t touch that with a ten-foot picture book pole. But I could easily see writing about what in his youth inspired his flight. Pick several historic figures who led “colorful” lives and play with how many ways you could present them to a picture book audience. Do you write boys books or girls books? Personally, I write books. Some of them are about people. Some are about animals. One is about religion. And I can honestly say that they would all appeal to both boys and girls. I’m not a complete knuckle head. I can see that some books appeal to girls much more than they appeal to boys. Think Fancy Nancy and Meg Cabot’s Princess Diary books. I’m not saying that no boy will ever read them, but the appeal will trend more towards girls than boys. The strange thing is that it isn’t as easy for me to name boy books. Sure, there are books that some marketing department or other has skewed boy — The Dangerous Book for Boys comes to mind. But honestly, I’m the one that read it. Not my son. What’s he reading? Right now he’s into the Walking Dead graphic novels. But several of the girls are reading them too. Why do we believe that boys only read books written by men and books with male characters? My son knew JK Rowling was a woman and he still read all the Harry Potter books. He also read The Hunger Games trilogy and Divergent is on his list. Female authors. Female main characters. This is one of those things that I find myself thinking about although I have to admit that I don’t have any answers other than some speculations about adults and our need to label things and people. Do you like to write for the Christian market? Then consider SHINE brightly magazine. This magazine is for girls ages 9 to 14 and is published by GEMS Girls’ Clubs (Girls Everywhere Meeting the Savior). The goal of GEMS is to help bring girls into a living relationship with Jesus Christ. Each issue features stories, articles, interviews, quizzes, poems, games, puzzles, crafts, and recipes. Remember this is a Christian publication and each and every piece needs to show a realistic depiction of the Christian life and show readers how Christian beliefs apply day-to-day. The word limist for fiction is 700 to 900 words. For nonfiction it is 200 to 800 words. The deadline for the summer issue is December 3rd. The topic for this issue is Sharing Your Faith. For details, read the guidelines posted here. 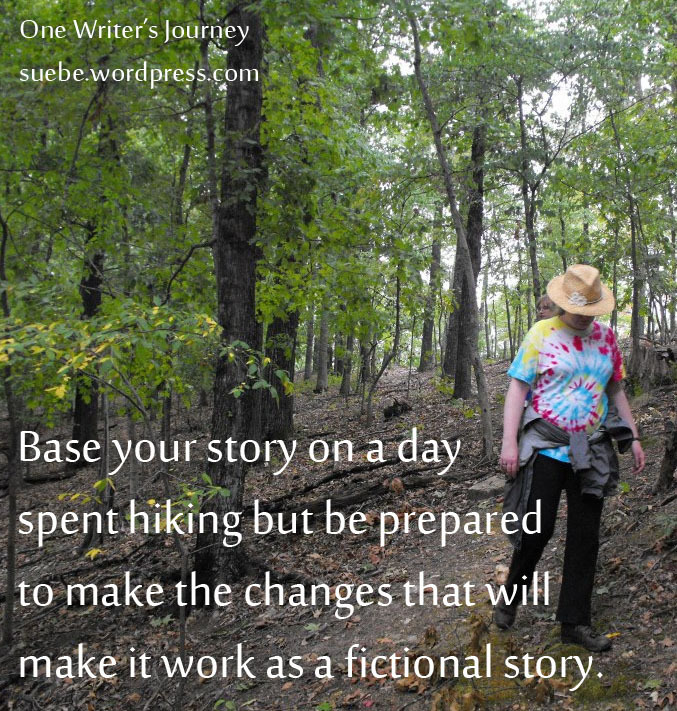 Have you ever tried writing a fiction story based on an event in your own life? It can be really tough. You want to write it the way that it happened and not change a thing. Motivations have to exist. In real life, you might have done something on a whim. “Let’s try this and see what happens.” That’s a lot harder to pull off in fiction. Your character has to want something specific and she has to have a reason for wanting it. The same holds true for your antagonist. He can’t want to mess things up for your protagonist for no reason what-so-ever even if that seemed to be the case in real life. Your story has to function as a story. Coincidence needs to be minimized in your story. Things can’t just randomly happen. Yes, that might be the way it happend in real life, because coincidents really do happen all the time. You look out the window just in time to see something happen. You show up a half hour early and miss a huge wreck on the highway. That’s fine . . . in real life. But too many coincidents in a story make it look like you did a bad job of planning things out. You have to make the real event work as a story and that will require making changes to what really happened. To find out about writing fiction based on a real historic event, read my post from yesterday at the Muffin.